Our trip to Vietnam gave us very weird, mixed feelings. We enjoyed some aspects but totally hated others, so I can’t truly say weather we liked it or not. 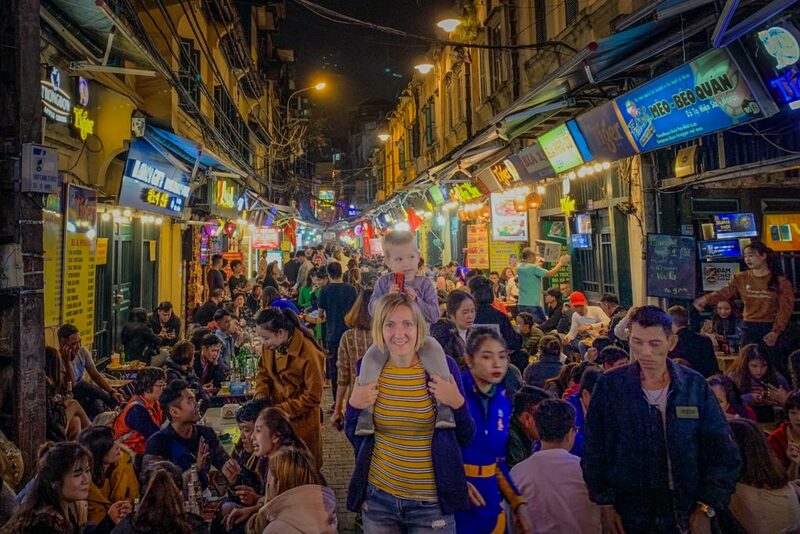 Friends usually ask me for recommendations from the places we’ve been, but after our trip to Vietnam I’m not able to decide to advise people go there or not. And it’s not just me! 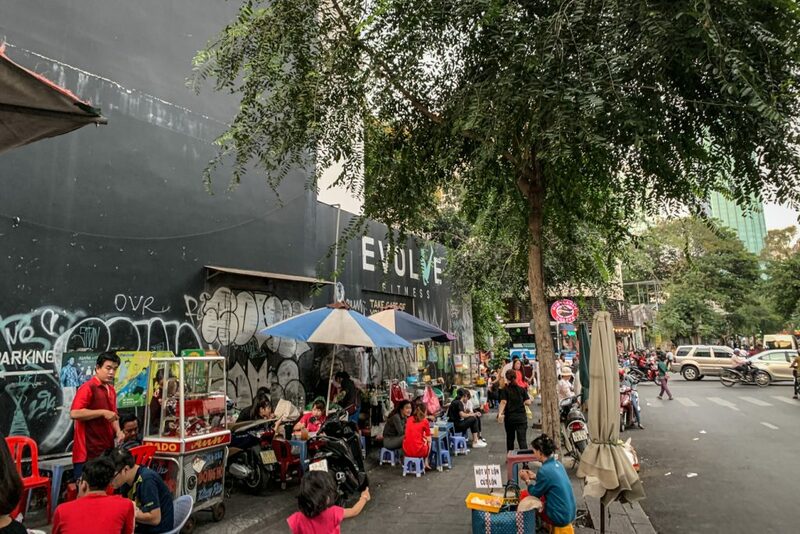 Official reports say that most of Vietnam visitors never go back; only about 30% of them pay a second visit, which is much lower than in other countries in South-East Asia. So I’ll just list here 10 things to know about Vietnam, based on our experience there. Hopefully they will help you be well prepared to travel to Vietnam. Without any doubts, Vietnam is the dirtiest country we have visited so far. And we’ve seen over 35 countries on 5 continents! So if you have low tolerance to trash, polution and minimum cleanliness, Vietnam is not for you. Or at least choose wisely, target premium locations and set proper expectations from the beginning. I don’t want to over-generalise here. You can find nice places, great restaurants and hotels, especially if you are not on a very low budget. Prices tend to be lower than anywhere else anyway. But expect to see piles of garbage everywhere and to feel strong smells in big cities. We heard lots of warnings about safety in Vietnam, regarding stealing and pickpockets. Even some of our hotel staff in Hanoi old quarter advised us not to keep anything valuable on sight. Luckily we had no issues and actually we never felt threatened or targeted in any way. I truly think, from this perspective, Vietnam is safer than people say. 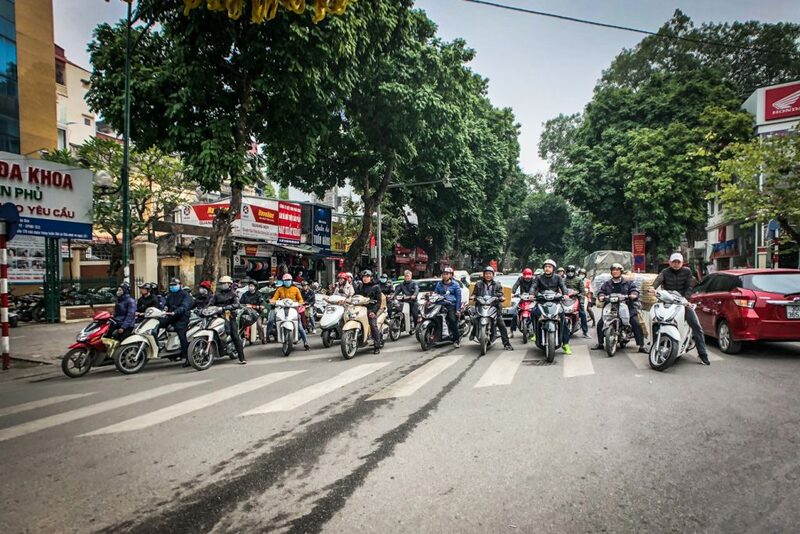 We heard about how crazy traffic is in Vietnam, but we always said people are exaggerating. In the end we were told similar stuff about driving in Sri Lanka too and we found it quite reasonable. We arrived in Hanoi first, and it didn’t seem too bad in terms of traffic. Still, we spent just the weekend there. Then in the rural area of Ninh Binh and in Hoi An it was really decent, just there were lots of motorbikes. Andrei was even saying “I told you not to trust everything you read!”. But then we got to Ho Chi Minh and he had to take those words back! 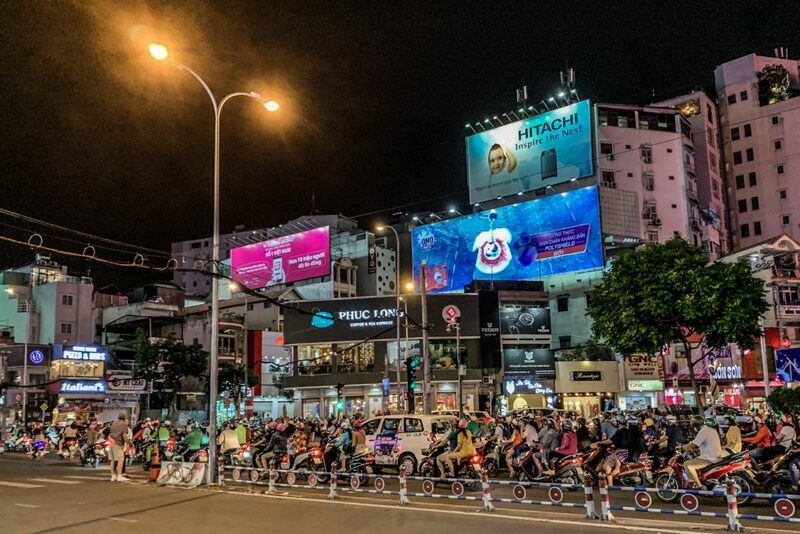 Traffic in Ho Chi Minh is something we’ve never seen before! Imagine hundreds of motorbikes waiting for the green light in the intersection and setting off all together in the same second. They were like a big school of fish! 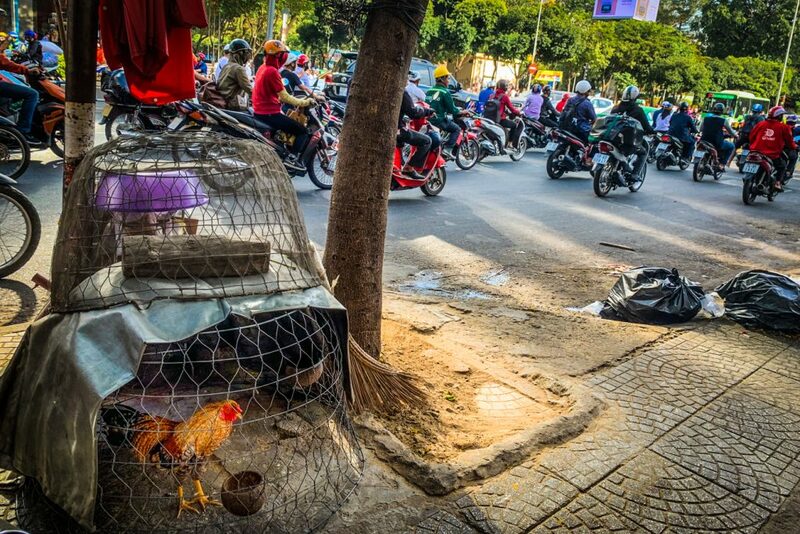 On top of this, the crosswalks mean nothing in Vietnam. Each time I was trying to cross the street, both the cars and motorcycles were honking and crossing around us. They very rarely stopped, if there was really no other option. The same for the traffic lights, as the pedestrian ones are just for tourists, the traffic usually stops just in big intersections. We always had to raise Eric up in our arms before crossing the street in Vietnam cities and even he felt annoyed by the chaotic traffic. Vietnam is a large country, widely stretched from north to south. So if you want to visit more places, you need to cross large distances. 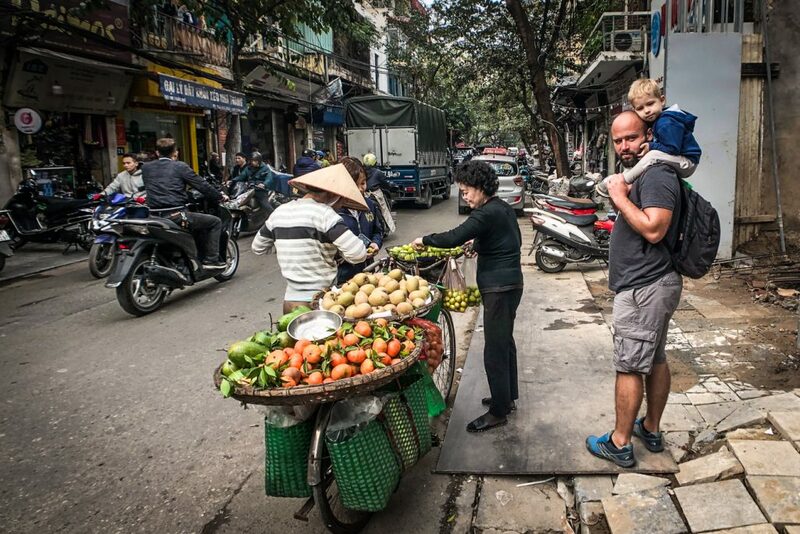 For us, traveling in Vietnam with a child, the best option was flying between the main locations. There are very accessible low cost options for internal flights; we used Vietjet airline and paid 20-30$/person/flight. We used ground transportation for short distances, but not to travel more that 2-3 hours. Roads are not extremely good and are usually very crowded. 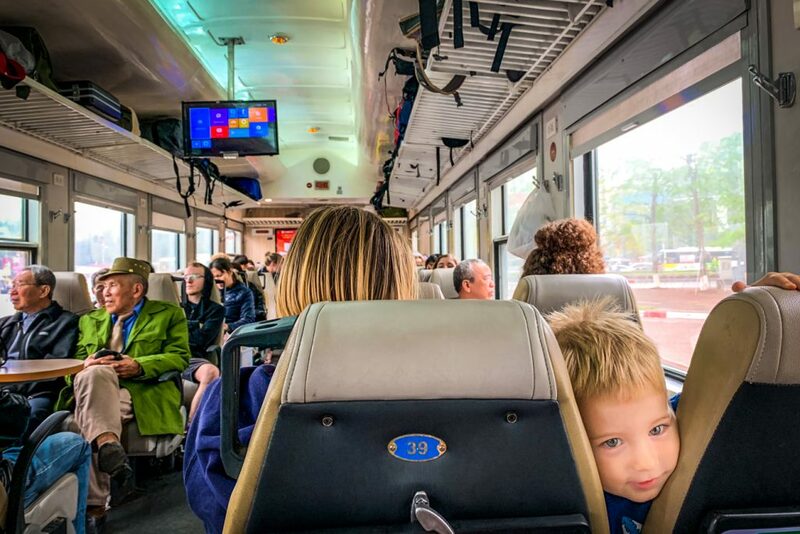 Trains in Vietnam are ok, but I don’t like sleeping trains, mostly because I feel bathrooms are horrible and definitely not suitable for a 3 years old. In Vietnam, you will be a millionaire. For real! Vietnamese Dong parity with US dollar is about 23,000 VND for 1 USD. So you can imagine prices quickly add up to hundreds of thousands and millions. We had a hard time in the first few days to distinguish between 5, 50 and 500 thousands bills. Having so many zeros is just too confusing. 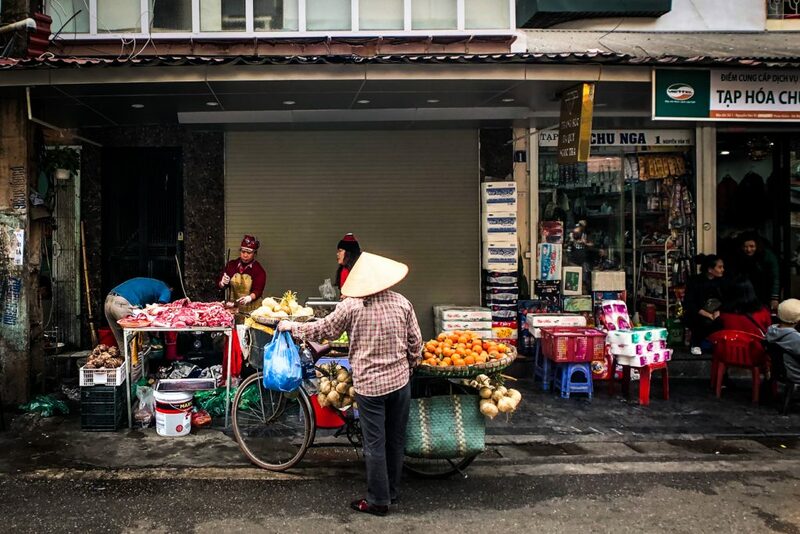 For Andrei, the best part about currency in Vietnam was that there are no coins. He hates the small metal pieces in his pockets and their clicking noise on the floor every time he changes his clothes! When mentioning Vietnam, every single person told me about how awesome Vietnamese food is. But most of them tried it in Vietnamese restaurants in Europe. Which is a totally different story! I can’t argue on this, Vietnamese food is indeed very good (I wouldn’t call it the best in the world though). But in Vietnam you have to be very careful where you actually try local food. Plus that in some areas you need to have a really strong stomach to be able to eat. 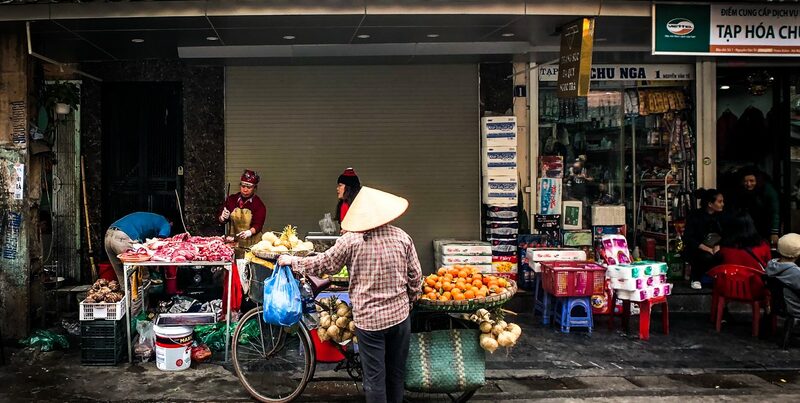 After walking on Hanoi’s old quarter I was ready to give up meat and become a vegetarian. Actually, I think I was not eating meat for almost one week. 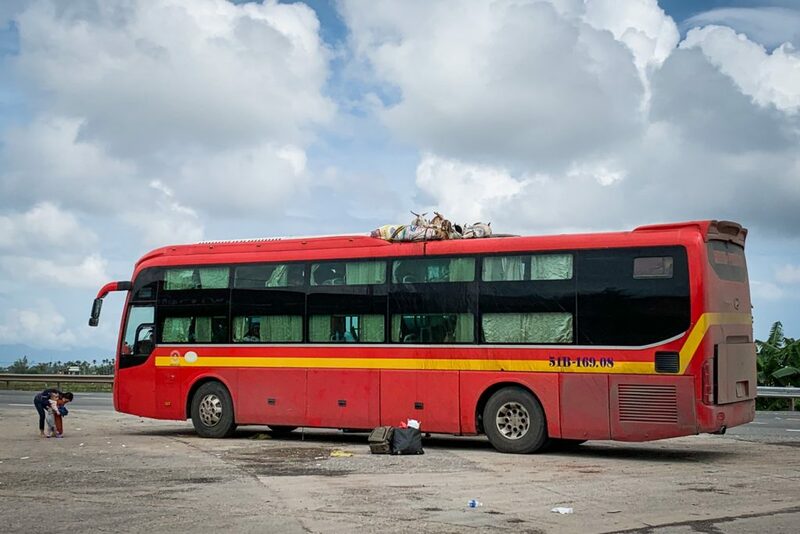 It is a challenge to walk around a big crowded city where streets smell like blood, fish, boiled chicken and rotten vegetables, combined with gasoline and exhaust gases. 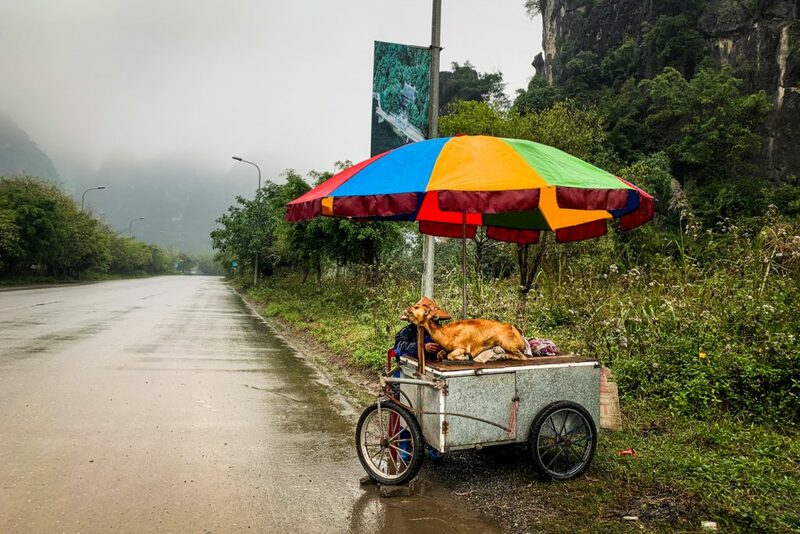 Add butcher tables in the middle of the street or boiling soup pots on the sidewalk, between motorcycles and stray dogs. This whole picture was not quite appealing for our appetite. 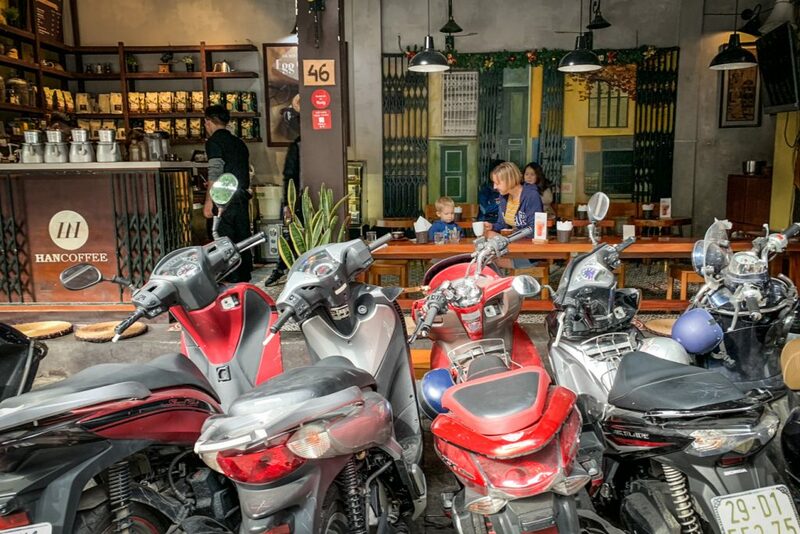 Don’t get me wrong, there are lots of great places to eat in all touristic places in Vietnam. It was just difficult for me to detach from what is on the streets and trust the cleanliness and hygiene. That’s highly important especially when visiting Vietnam with a toddler. Luckily, none of us had any stomach problems, but I heard them to be quite frequent in Vietnam. Traveling in Southeast Asia in general raises concerns on hygiene and medical issues. So when you travel in Vietnam with a young child there are some things to consider. There are no special needs in terms of vaccinations for Vietnam, in the areas we’ve visited. There are malaria warnings in the mountain region. But for this reason we decided to avoid those areas altogether. Except for being extra-cautious regarding drinking water, there was nothing else we did. We always drink only bottled water when traveling. But in Vietnam we avoided ice drinks too and Eric used bottled water for brushing his teeth too. We did not eat fruits sliced on the street and bought just whole fruits instead. We were all fine during our whole stay in Vietnam. But no matter how much care we took, we interacted with Vietnam’s medical system on an unexpected way. The first day we arrived in Can Tho, in Mekong Delta, Eric felt by the pool and needed a stitch on his back-head to stop the bleeding. You can’t imagine how shocked and scared I was! Luckily we were staying at an awesome hotel and they took great care for us, drove us to the hospital and waited until the whole procedure was over. 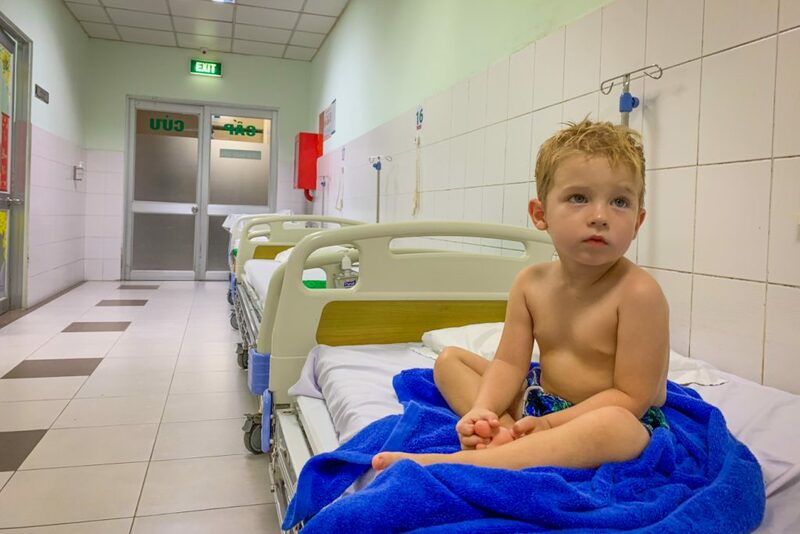 Andrei was impressed by the way the hospital was organised and said all the procedures were conducted the same way as in any other hospital he’ve been before. So, preferably not to need any healthcare in Vietnam, but still, if you do, it’s good to know the medical conditions are very good, same as back home. Not to mention the final invoice, that was just a bit over 20$, including bandages and disinfectants to use the following days! It is very likely that you will need a visa to enter Vietnam. But it is more a formality, just a bureaucratic procedure and there’s no issue getting it if you follow all the steps. Check our detailed post about how to get the visa for Vietnam, for more information. 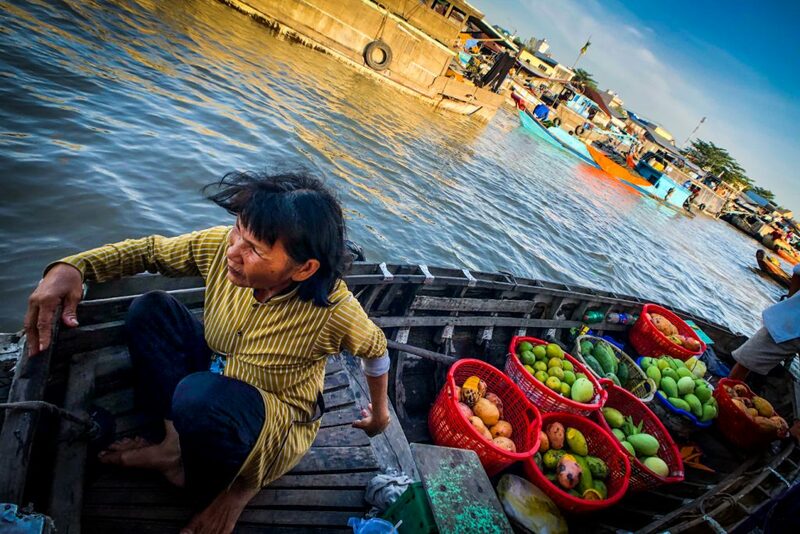 Vietnam is a very poor country, so don’t take it personally if people try to overcharge you. Just bear in ming that you should pay 40-60% of the first asked price and stick to your offer. With a bit of patience you will get there! This is available anywhere, from taxis, to parking fees, guides and souvenir shopping. If in doubt, ask at your hotel how much should you pay for what you want. Our hosts were always willing to help and gave us the best advice. We are used to be overlooked as “exotic” while traveling. Especially for myself and Eric, it happened in South America too and in most of the Asian countries. But in no other place we visited, local people were as pushy towards Eric as in Vietnam. I can understand people insistently looking at him, you don’t see blue eyed blond hair little boys very often in this part of the world. I can even tolerate briefly touching his hand or hair, if he doesn’t seem bothered. But I can’t accept people to grab him, kiss his hands, try to hold him or following him all around the place if we clearly seem disturbed about it. Actually, the way our personal space was invaded a lot of times in Vietnam got me really angry a few times. People should learn to respect each other, including the children! On the other hand, each time I went with Eric to a playground in Vietnam, I was approached by local kids trying to practice the English they learned at school. They were adorable and reminded me of our own childhood, when we just knew some basic standard English phrases. I wish I could communicate more with them!